LONDON: UK, Wednesday 9 May: Bat expert Dr Rodrigo Medellin, of Mexico, tonight became the first winner of a newly-created annual award from the UK-based Whitley Fund for Nature (WFN) honouring an outstanding individual contribution to conservation. Dr Medellin received his award from the charity’s Patron Her Royal Highness The Princess Royal (Princess Anne) during a ceremony at the Royal Geographical Society, London, at which grants worth a total of £240,000 were given out. The Gold Award comes with £30,000 project funding, donated by The Friends of Whitley Fund for Nature. 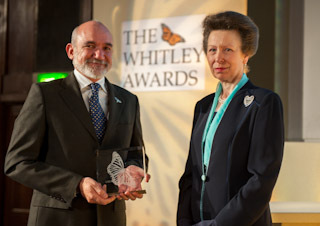 The remaining £210,000 is shared by the latest seven winners of Whitley Awards for inspirational leadership – an accolade Dr Medellin won in 2004 and which he credits with helping him to set up his conservation non-profit BIOCONCIENCIA. Dr Medellin’s most recent achievement is that, thanks to conservation measures he put in place, the lesser long-nosed bat will soon become the first species ever to be removed from Mexico’s Federal List of Endangered Species. Copyright-cleared photographs of each finalist and their projects can be accessed now from https://picasaweb.google.com/105548002819098368093. Photographs of winners receiving their Whitley Awards from HRH The Princess Royal will be available from the same site from about 2200hrs BST on 9 May. In addition, short films about each of the winning projects will be on Green TV as soon as the ceremony ends.